On Sunday, the newest students arrived at one of the nation’s oldest medical schools and donned the white coats that mark the start of their journey toward becoming physicians. This year’s class of 169 incoming U-M Medical School students were the first to take a new oath during the annual White Coat Ceremony at Hill Auditorium. Called the UMMS White Coat Pledge, it focuses on the elements of “humanism” that can get lost in modern medicine. The pledge was created by members of the school’s chapter of the Gold Humanism Honor Society, which is named for the late Columbia University physician Arnold P. Gold, M.D. A national leader in ensuring that health care providers receive training in providing compassionate, patient-centered care, Gold started the tradition of the White Coat Ceremony decades ago. Mangrulkar noted that the school’s curriculum, fully implemented over the past three years, affords many opportunities to explore the human aspects of medicine. All students will complete a Capstone for Impact project before they graduate — a student-led initiative to move medicine forward and make an impact on a major challenge in health care and health system delivery, with patients in mind. 7,515 people applied for a spot in this year’s class, an eight percent rise over last year. Only 445 made it to the interview stage — which was an even more selective round than last year. Ten students will pursue both an M.D. and Ph.D. degree through the Medical Scientist Training Program. Additionally, three students who already hold dental degrees will train in oral and maxillofacial surgery. 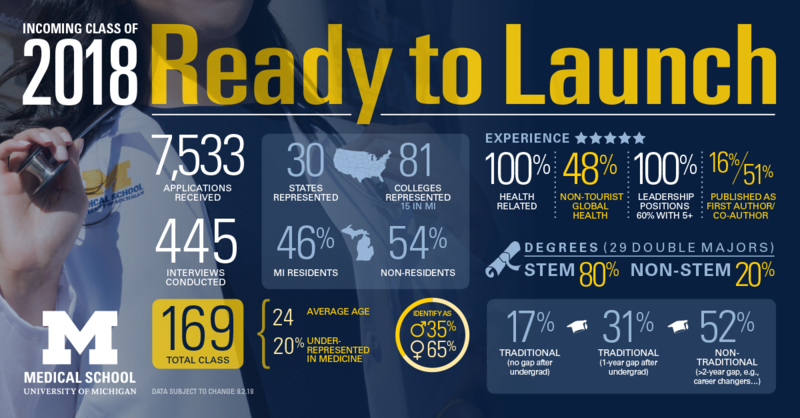 Many others may choose to pursue a second degree at other U-M schools, through any one of the dual-degree programs open to medical students.